BPMN 2.0 takes dancing lessons – do we need choreographies? The two BPMN 2.0 proposals are out and already spurred quite some discussion in the BPMN blogging community. One of the changes that seem to remain mysterious about BPMN 2.0 are choreographies. Bruce Silver mentions the “brand new choreography model that nobody understands (or cares about)” in one of his posts. So it’s high time to shed some light on this topic. First observation: Choreographies are already part of BPMN 1.x. Really? What is a choreography anyway? I often use the following definition: “a choreography lists all possible interactions between a set of business partners, together with the behavioral constraints between them.” So the focus is on INTERACTIONS. Choreographies are business protocols, interaction contracts between business partners that want to engage in a collaborative business process. Choreographies only prescribe the observable behavior of partners, not their internal behavior. Please send an email to bpmn-poster-bpt-2008@hpi.uni-potsdam.de. Postal charges within Germany are 7€. The poster is free for download if you want to print it yourself. The Object Management Group released a new version of BPMN early this year. The current version 1.1 comes with a number of notational changes and even new constructs. We have created a BPMN 1.1 Poster that summarizes all language constructs on one page. You are free to download it and print it. You can choose between an English version and a German version. A document summarizing the key differences between BPMN 1.0 and BPMN 1.1 can be found here. The Conference on Advanced Information Systems Engineering (CAiSE) is one of the world’s leading academic conferences in the area of information systems and process modeling. This year’s CAiSE took place in Montpellier, France from 16 – 20 June and it featured quite a number of presentations concerning BPMN and “good” process modeling. Not only could I experience that many BPM researchers share a common interest: following football games. I could also enjoy quite a number of inspiring presentations. In this article I point to some I found particularly interesting. Do we actually need BPMN? 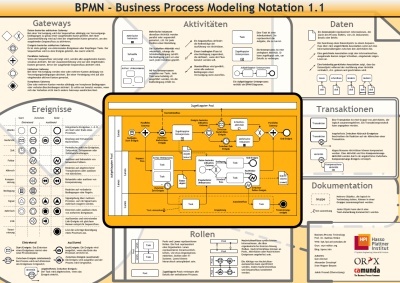 The Business Process Modeling Notation (BPMN) has gained major interest from industry and academia. But do we actually need it? Do we need process modeling? Process-oriented thinking helps you understand what you actually do in your organization and how the different activities relate. It reveals who depends on whom and what document is created where and why. Process models help you eliminate waste in your operations and serves as map for pinpointing where you want to change. Process models help you communicate and assign responsibilities for decisions and activities to people. Process models also help you think about where IT support is useful and where it isn’t.